Hurricane Fred is located about 35 mi…55 km S of Rabil in the Cape Verde Islands and about 65 mi…100 km NE of Praia in the Cape Verde Islands with maximum sustained winds…80 mph…130 km/h. Present movement…NW or 305 degrees at 12 mph…19 km/h. Hurricane Ignacio is located about 320 mi…515 km E of Hilo Hawaii and about 500 mi…805 km E of Honolulu Hawaii with maximum sustained winds…115 mph…185 km/h. Present movement…NW or 325 degrees at 9 mph…15 km/h. Hurricane Kilo is located about 530 mi…855 km S of Midway Island with maximum sustained winds…135 mph…215 km/h. Present movement…NNW or 330 degrees at 8 mph…13 km/h. Hurricane Jimena is located about 1430 mi…2295 km E of Hilo Hawaii with maximum sustained winds…150 mph…240 km/h. Present movement…WNW or 285 degrees at 17 mph…28 km/h. Invest 90 is an area of disturbed weather in the North Atlantic that has the potential for tropical development. Invest 97E is an area of disturbed weather in the East Pacific that has the potential for tropical development. Sea levels around the world have risen by an average of nearly 3 inches since 1992, with some areas experiencing a rise of more than 9 inches, according to a NASA analysis of satellite observations. Experts say that changes in sea level vary widely around the world due to local conditions, but climate change is the main driver. Scientists estimate about a third of the rise is due to expansion caused by warming oceans, while the remainder is evenly divided between ice loss of the massive Greenland and Antarctic ice sheets and the melting of mountain glaciers. NASA scientists told a press conference that they now have data to help planners determine what coastal areas will be threatened by sea level rises over the next century. 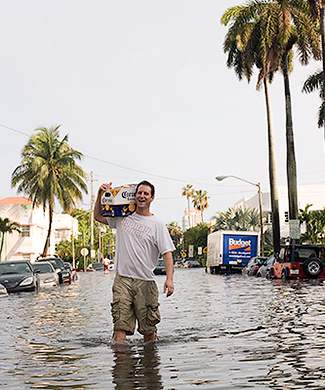 Even today, normal spring high tides cause street flooding in sections of Miami, something that didn’t happen regularly just a few decades ago. About the only promising development to come out of the conflict-ravaged Middle East in the past few years is a pronounced drop in greenhouse gas emissions. With untold thousands of refugees fleeing to Europe from Syria and Iraq, the shattered economies they leave behind are in no shape to burn the volume of fossil fuels they did prior to the onset of the Syrian civil war. 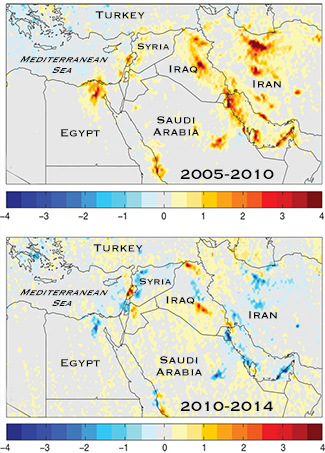 Nitrogen dioxide emissions have plunged 40 percent over Damascus and 50 percent over Aleppo since Arab Spring protests reached Syria in 2011. But he adds that air pollution reductions instituted by neighboring Israel, Saudi Arabia, Kuwait and the United Arab Emirates have also contributed to the region’s overall drop in carbon emissions. This graphic of nitrogen dioxide measurements from space illustrates the trend toward less greenhouse gas emissions. Manam (Papua New Guinea): A volcanic ash plume at estimated 7,000 ft (2.1 km) altitude extending 70 km north from the volcano was reported this morning (VAAC Darwin). Karangetang (Siau Island, Sangihe Islands, Indonesia): The eruption continues at the volcano: it is characterized by Strombolian activity at the summit crater and lava extrusion that forms frequent incandescent avalanches. Dukono (Halmahera): Continuous ash emissions are being observed from the volcano, generating plumes at 2-3 km altitude that drift up to 70-80 km to the east (Darwin VAAC). Lokon-Empung (North Sulawesi, Indonesia): A small eruption occurred again last Saturday, producing an ash plume that rose approx. 2 km and drifted northeast, caused a temporary closure of the Manado airport. The explosion occurred around 23:50 local time a vent in or or near Tompaluan crater. The volcano remains at alert level 3 (“siaga”) on a scale of 1-4 and a safety zone of 2.5 km around the crater is recommended as similar, sudden explosions are likely to occur again from time to time. Kilauea (Hawai’i): No significant changes have occurred at the ongoing eruption on both the summit vent (Halema’uma’u lava lake) and the east rift zone. During the past days, lava flows have resurfaced most of the interior of what is left of Pu’u ‘O’o crater. The lava lake at Kīlauea’s summit remains active, and periodically rises and falls along with cycles of inflation and deflation. At the moment, summit tilt meters have been recording deflation. The new East Rift Zone lava flow northeast of Puʻu ʻŌʻō remains active within 8 km (5 mi) of the vent. The flow does not currently pose a threat to communities. Low levels of seismic activity continue across the volcano (HVO). 5.1 Earthquake hits south of Lombok, Indonesia. Hurricane Ignacio is located about 495 mi…800 km ESE of Hilo Hawaii and about 705 mi…1135 km ESE of Honolulu Hawaii with maximum sustained winds…145 mph…230 km/h. Present movement…NW or 315 degrees at 8 mph…13 km/h. Hurricane Kilo is located about 500 mi…800 km WNW of Johnston Island and about 665 mi…1070 km S of Midway Island with maximum sustained winds…140 mph…220 km/h. Present movement…WNW or 290 degrees at 9 mph…15 km/h. Hurricane Jimena is located about 1365 mi…2200 km WSW of the southern tip of Baja California with maximum sustained winds…130 mph…215 km/h. Present movement…WNW or 290 degrees at 13 mph…20 km/h. Health officials in Morocco are investigating an outbreak of anthrax in the town of Imilchil in Midelt province. Nine people have been diagnosed with cutaneous anthrax linked to exposure to handling diseased cows. Cutaneous anthrax occurs when the spore (or possibly the bacterium) enters a cut or abrasion on the skin. It starts out as a raised bump that looks like an insect bite. It then develops into a blackened lesion called an eschar that may form a scab. Lymph glands in the area may swell plus eodema may be present. This form of anthrax responds well to antibiotics. If untreated, deaths can occur if the infection goes systemic. 95% of cases of anthrax are cutaneous. Evacuation orders are in place for parts of Prairie City, a town of approximately 900 people near John Day in Eastern Oregon. Fire officials said the strong winds Saturday morning pushed the Canyon Creek Complex both north and east, and they’re worried that windy conditions will test efforts throughout the day. The Tepee Springs Fire is burning about 48,000 acres as of Saturday, with some flames jumping north across the Salmon River, according to fire officials. Residents near Riggins have been told to evacuate amid two days of aggressive growth, and the fire also prompted the emergency closure Thursday of nearly 18 miles of the Lower Salmon River to all recreational use. In North Idaho, a group of blazes, now dubbed the Clearwater -Municipal-Motorway North Complex that earlier destroyed 42 homes near Kamiah is now 75 percent contained and at about 130 square miles. The Rapid Fire has burned 6,422 acres in subalpine and mixed conifer forest about 12 miles southeast of McCall as of Saturday. It is 40 percent contained. The fire grew about 1,000 acres due to winds and heavy fuel Thursday. With air support crews worked to strengthen containment lines around the southern part of the fire Friday and Saturday. The 1,237-acre Cougar Fire, about 20 miles northeast of Cascade in Valley County,was about 90 percent contained as of Saturday. Fire crews continue to be released over time, though fire managers remain watchful for strong winds, reaching gusts of 30 mph Saturday that could scatter embers outside the containment lines. The Campbells Fire was reported at 6,720 acres Friday in the Frank Church-River of No Return Wilderness southeast of Dixie. It is burning through timber in Fall, Ruf, Moore and Trout creeks, and now includes Burnt Knob. Crews are doing structure protection at Campbells Ferry. About 20 residences in rural areas south of Libby were told to evacuate Saturday morning because of one of several fires burning in the Kootenai National Forest, fire spokeswoman Jennifer McCully said. Elsewhere, the towns of Essex in Flathead County and Heart Butte on the Blackfeet Indian Reservation remain under evacuation orders. 5.3 Earthquake hits the Volcano Islands. 5.1 Earthquake hits the Maug Islands in the North Mariana Islands. Tropical Storm Erika is located about 75 mi…125 km S of Guantanamo Cuba with maximum sustained winds…40 mph…65 km/h. Present movement…WNW or 290 degrees at 20 mph…31 km/h. Erika has devastated Dominica where nine inches of rain fell late on Wednesday, and six more early on Thursday, causing floods and landslides. At least 20 people have died with Katy least 31 more still missing. Hurricane Ignacio is located about 660 mi…1060 km ESE of Hilo Hawaii and about 870 mi…1400 km ESE of Honolulu Hawaii with maximum sustained winds…90 mph…150 km/h. Present movement…WNW or 300 degrees at 9 mph…15 km/h. Hurricane Kilo is located about 260 mi…420 km WNW of Johnston Island and about 765 mi…1230 km SSE of Midway Island with maximum sustained winds…75 mph…120 km/h. Present movement…WNW or 285 degrees at 9 mph…15 km/h. Hurricane Jimena is located about 1220 mi…1965 km SW of the southern tip of Baja California with maximum sustained winds…150 mph…240 km/h. Present movement…W or 270 degrees at 9 mph…15 km/h. 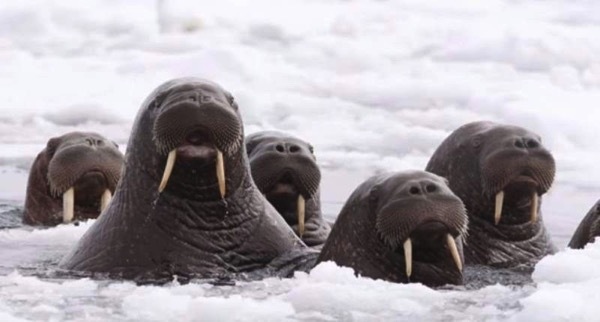 The extreme loss of Arctic sea ice due to climate change is forcing thousands of walruses to crowd ashore on a remote barrier island off Alaska, and threatening their survival. The first reported sighting of animals forced to come ashore in the Chukchi Sea was by a photographer on 23 August, and confirmed by villagers in the remote hamlet of Point Lay late on Thursday, the US Fish and Wildlife Service said. Such landings, forced by the absence of sea ice on which to rest and feed, put the animals at risk of stampede in the limited space of the barrier island. The animals are easily spooked by aircraft or onlookers, government scientists warned. Trampling deaths are one of the biggest natural risks. Sea ice cover in the winter months fell to a new low this year because of climate change and abnormal weather patterns. Some scientists believe the Arctic could be entirely ice-free in the summer months by the 2030s – with profound effects for local indigenous communities that rely on the ice, as well as wildlife that depend on extreme conditions. Since 2000, the forced migration of walruses and their young to barrier islands such as Point Lay — known as a “haul out” — has become an increasingly regular occurrence, according to US government scientists. Last year, as many as 40,000 animals, mainly females and their young, were forced ashore. It was the biggest known haul-out of its kind in the US Arctic, according to government scientists. The Federal Aviation Authority re-routed flights and bush pilots were told to keep their distance to avoid a stampede. Wildfires destroy forest around the world’s oldest and deepest fresh-water lake, Lake Baikal in Russia. By Thursday over 25,000 hectares of forest had been scorched. At least three people have been killed and thousands left homeless by bush fires raging in eastern Democratic Republic of Congo. Health authorities in Quebec’s Lanaudière region said an outbreak of Legionnaires’ disease has killed two people and infected another 16. 5.3 Earthquake hits the Kuril Islands. 5.0 Earthquake hits the Alamagan region in the North Mariana Islands. Tropical Storm Erika is located about 155 mi…250 km ESE of Santo Domingo Dominican Republic and about 430 mi…690 km ESE of Great Inagua Island with maximum sustained winds…50 mph…85 km/h. Present movement…WNW or 290 degrees at 17 mph…28 km/h. The storm was expected to dump up to 12 inches (31 centimetres) of rain across portions of the drought-stricken northern Caribbean as it carved a path toward the U.S. Forecasters said Erika might fall apart over Hispaniola or Puerto Rico or possibly strengthen into a hurricane as it nears South Florida early next week. Hurricane Ignacio is located about 890 mi…1430 km ESE of Hilo Hawaii and about 1100 mi…1770 km ESE of Honolulu Hawaii with maximum sustained winds…90 mph…150 km/h. Present movement…WNW or 295 degrees at 12 mph…19 km/h. Tropical Storm Kilo is located about 35 mi…55 km NW of Johnston Island and about 905 mi…1460 km se of Midway Island with maximum sustained winds…70 mph…110 km/h. Present movement…WSW or 255 degrees at 7 mph…11 km/h. Nepal – A heavy downpour in Bhaktapur on Thursday inundated at least 60 houses. 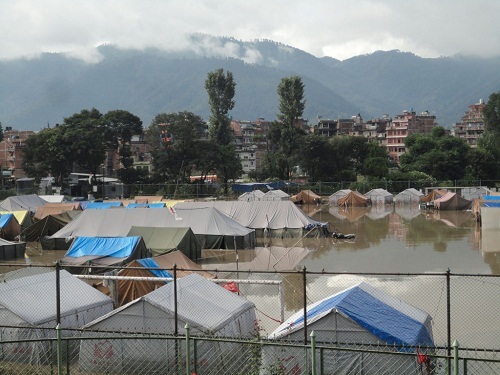 The flooding caused by the swollen Hanumante river has flooded temporary shelters for earthquake survivors in the district.